SawStop Contractor Saw Now Available for shipment from Highland! We are excited to announce that we can now sell and ship the SawStop Contractor Saw to our customers nationwide within the lower 48 states. Sawstop’s brake design is well known for its unique ability to instantly stop and retract the blade upon any contact between the sawblade and your skin. 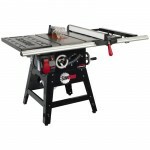 More information about the SawStop Contractor Saw, available at Highland Woodworking. The Plane Facts: Tips for non-traditional router plane usage The Highland Woodturner October Issue is OUT!